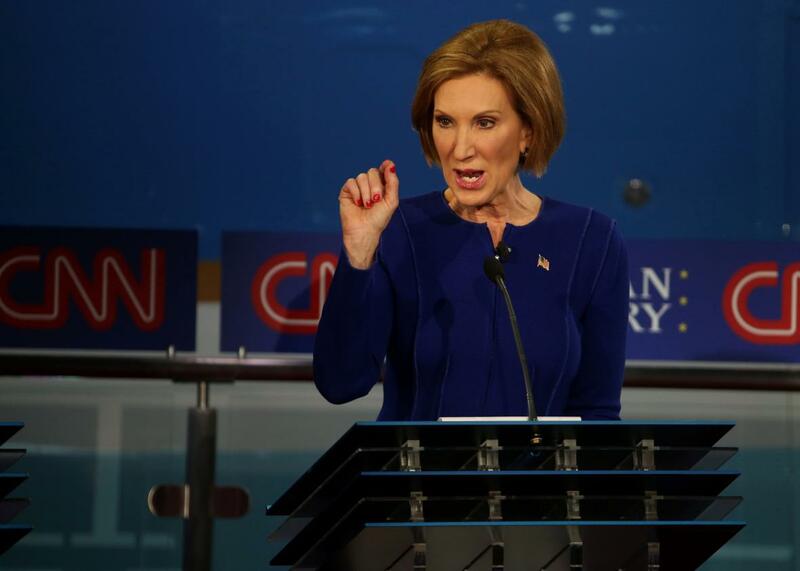 CNN poll: Carly Fiorina surges to second place as Donald Trump loses ground. Carly Fiorina take part in the presidential debates at the Reagan Library on Sept. 16, 2015 in Simi Valley, California. A good debate performance appears to have helped Carly Fiorina shoot up from the bottom rung of Republican hopefuls into second place, according to the latest CNN/ORC poll that shows Donald Trump losing some ground but remaining in the lead. The real estate mogul enjoys 24 percent support among Republicans, which is an 8-point drop from earlier this month, when a similar poll had him at 32 percent. “I’m a little surprised, because other polls have come out where I actually picked after the debate, I actually gained after the debate,” Trump said on CNN’s State of the Union on Sunday. Fiorina ranks second with 15 percent support, a huge surge from early September, when the former Hewlett-Packard chief executive received a paltry 3 percent support. She is one point ahead of Ben Carson, who has 14 percent support, a 5-point drop from earlier this month. Considering the poll’s margin of error, it means Carson and Fiorina are pretty much tied for the second spot. And it once again shows how Republicans are raging against the establishment; the top three contenders have never held political office. One politician, however, does seem to be gaining some ground. Sen. Marco Rubio saw his support rise from 3 percent to 11 percent in less than a month, putting him in fourth place. In the CNN poll, Jeb Bush has 9 percent support and Sen. Ted Cruz and Mike Huckabee are tied at 6 percent each. Support for Wisconsin Gov. Scott Walker, meanwhile, has collapsed. Once seen as the leader in Iowa, Walker now enjoys less than 1 percent support, dropping from 5 percent in early September. That puts Walker in the same category as former Virginia Gov. Jim Gilmore, Sen. Lindsey Graham, Louisiana Gov. Bobby Jindal, and former New York Gov. George Pataki.